Golf has more gadgets and training aids that are supposed to help your game than any other sport and a lot of them are for putting. Most of them are completely useless. I know, I tried a lot of them. But some of them actually helped and I still use them when I work on a specific aspect of my putting. I put this one first because putting is one skill in golf that you can practice indoors just about anywhere. Only have a small apartment? No problem, grab a putter and putt on the carpet. But if you want something that is one step above the carpet then you should get a decent putting mat. I chose this one for a few reasons. First, it’s simply a good quality mat. Putting mats don’t wear as fast as hitting mats but they do wear, especially if you are using them constantly. So it’s important that they are durable. I also like the consistency of the turf. No small mat is going to perfectly replicate the feel of a real green (not to mention the fact that every green is different). However, this one let’s you roll the ball fairly realistically if you put it on a flat surface. The second reason I like this one is that it has some alignment marks built into the mat itself. When you are working on short putts like this indoors, the best thing to work on is making sure you are rolling the ball straight to your intended target. Slight variations in your stance and setup could leave you thinking you are aligned properly when in fact you are not. The lines help you train your eyes to set up properly. If you are consistently hitting the ball to the same side of the guidelines, then you may just need a simple setup adjustment to start rolling it straight every time. To check out the current price on Amazon…CLICK HERE. This simple little device was made popular by Rory McElroy after the 2014 Open Championship. He explained in interviews that he would spend about 15-20 minutes before every round working with this alignment mirror. 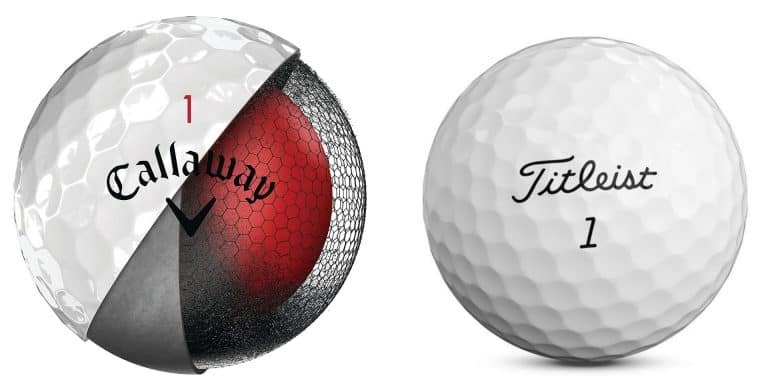 The purpose of this training aid is to let you identify whether your eyes are above the ball at the right angle and if your putting stroke is aligned properly. All you do is find a straight putt somewhere on the practice green and line up the Eyeline to that hole. Then using the mirror, get yourself lined up properly. The lines on the mirror let you know if your setup is correct. Then if you are missing the putt consistently in one direction, you can more easily diagnose what is causing the problem. The portability of this device is a great feature. You can leave it in your bag so you have it before every round. It doesn’t weigh much or take up much space. It also has a place to put tees in it as a gate of sorts to putt the ball through. This one is pretty simple. It has more to do with the efficiency of your practice sessions than actually practicing a specific skill. All it does is return the ball to you when you “make a putt.” So why is that so helpful? Practice time is valuable. Anything that saves you time during a practice session can increase the number of repetitions you can get through in a given amount of time. This lets you focus more on whatever drill you are actually performing rather than gathering the golf balls that you’ve already putted. What it does is narrow the target to a very small hole in the back of a sloped ramp. 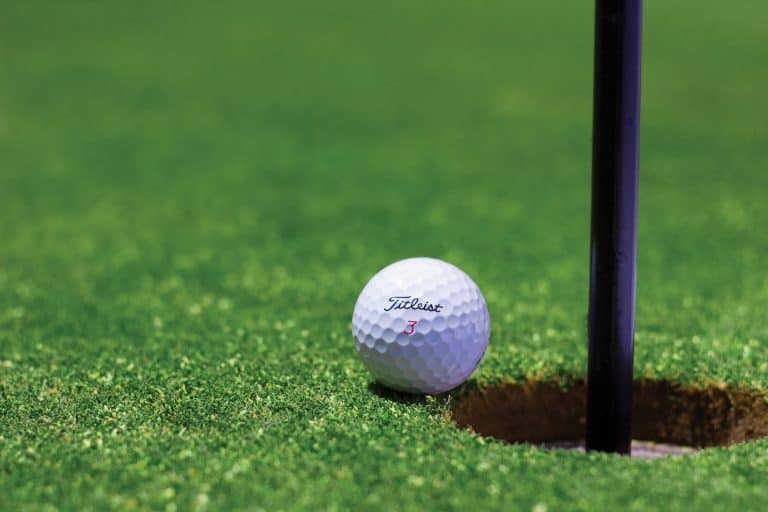 If you putt the ball with good speed and accuracy, then it will go into the hole. If not, it rolls back to you. That’s the part I like. It lets you keep moving through your practice routine quickly without rushing. It also lets you practice anywhere. This usually means on a carpet or artificial putting mat at home. But this little device is also small enough to take to the course with you and use on the practice green. That means you can work on your drills anywhere on the putting green and stay out of the way of other golfers. This is a unique putting training aid. It is a laser level that clips to the brim of your hat. It projects a laser line on the ground that you aim and level with your head tilt. It performs two important functions. First, it tells you if you are holding your head level when you set up for a putt. If your head is tilted then the line is tilted. So you can check your head position very easily. Second, and more importantly, the line it projects on the ground can be used as an alignment aid for your putter and to ensure you are putting the ball straight. The benefit of this as opposed to just laying down an alignment stick is that there is nothing in the way of your swing. The downside to this is that some people choose to putt with their head tilted. In fact, some instructors will tell you that this is preferred as it helps visually connect you to the target. Phil Mickelson is one that rarely has his eyes level while putting. If you don’t want to keep your head level while putting or this device is out of your budget, a simple chalk line is a great inexpensive alternative. Just remember, pick a spot and stay there. No one wants chalk lines all over the putting green! Like I said above, there’s a lot of garbage out there on the market and all of them claim to be the next big thing to take your putting to the next level (or some other marketing jargon like that). In reality, a good putting aid should be simple. It should be easy to use. And it should allow you to focus on a specific aspect of your putting while giving you quick and simple feedback on mistakes. After all, the goal is to develop a smooth and solid putting stroke that you can actually perform without the putting aid in front of you. You also want a putting aid that fits your swing type. For example, a golfer with an arc putting stroke would not benefit from a device that promotes a straight back and straight through stroke. Whether it’s these training aids or others that you find out there, keep these factors in mind when you are trying new things. It may save you from over spending on things that won’t help. What’s your favorite training aid for putting? Let me know in the comments below if I missed a good one? PrevPrevious PostWhat Is A High MOI Putter?